A little update about our mobile phone documentary from Africa and Zanzibar. A first draft is now finished and can be read in its full context on our webpage. I have outlined the main ideas we want to express, what we have done so far, the characters ans stories we like to present and more. 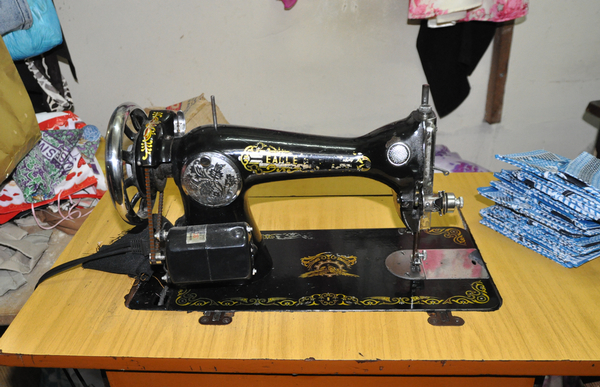 The picture below shows the sewing machine of the local tailor on Hurumzi street who produced 200 awesome DVD covers made out of recycled Kangas (and by the way, we found out that uzi in swahili means “thread”). Next step in the post-production process is the making of a trailer. Stay tuned & read all about it! Jambiani was the first village in Tanzania that started with seaweed farming. The practice began almost 20 years ago and the harvesting was and is still done almost exclusively by women. This was once one of the only ways for women to earn their own money, giving them a greater independence in the household. Jambiani is considered a good place to farm since the weather and environmental conditions are optimal. Seaweed can be used for the Pharma industry, cosmetics, plastics and a variety of other uses. Sadly, the profit does not make it back to the community. Two main companies run the show, a Tanzanian state and a Japanese company. We arranged for a private course in Swahili at the Jambiani Primary school. The school is located in the exact center of the village and teaches about 1.200 pupils. For one month, three days per week, we attended school classes; sitting on benches made for 7-year old kids. Mr Faridi was our tutor and mentor- he unlocked the code of Swahili for us. Mr. Faridi even arranged a special class about mobile phones for us. We met and discussed with other teachers as well regarding their views on the possibilities and challenges of mobile phones.